Reliance Jio has once again extended its cashback offer. First launched in early November, the Jio Triple Cashback offerprovided Jio Prime customers benefits worth up to Rs. 2,599 if buying recharges of Rs. 399 or higher. To recall, the cashback vouchers are provided by Reliance Jio itself, apart from payment wallets, as well as fashion and retail websites. The company had extended the cashback offer's deadline from November 25 till December 15 last month, and now on Monday, has extended the deadline till January 15. With the extension, a slight change to the cashback offer has also been made. To reiterate, under the Jio Triple Cashback offer, subscribers who purchase recharges of Rs. 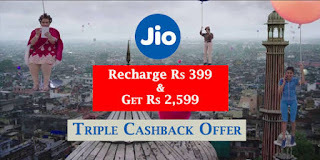 399 and above from MyJio or Jio.com site will get Rs. 400 cashback in the form of eight vouchers of Rs. 50. These vouchers can be used to deduct Rs. 50 while purchasing future recharge packs. If you use digital wallets to pay for the recharge pack, you will get cashback in there as well. So for example, if you join the Jio network as a new user and use Amazon Pay to buy a Rs. 459 recharge, you will receive the vouchers worth Rs. 400 from Jio and Rs. 50 cashback as Pay balance, totalling Rs. 450. Both the wallet cashback and the Jio vouchers can be redeemed immediately. There are only two major changes since the last extension - the Paytm cashback for new recharge users has dropped from Rs. 50 to Rs. 15, while the PhonePe cashback for existing users rises from Rs. 0 to Rs. 10. On top of the cashbacks, Jio is also offering discounts on online fashion and travel purchases (up to Rs. 1,899) to raise the total value of the offer to Rs. 2,599. Under the cashback offer, you will get Rs. 399 discount on transactions worth Rs. 1,500 and above on AJio.com, and Rs. 500 instant discount on purchases of Rs. 1,999 and above on Reliancetrends.com. Similarly, Jio's partnership with Yatra.com will give you a Rs. 1,000 discount on round trip domestic flights, and Rs. 500 on a one-way ticket.